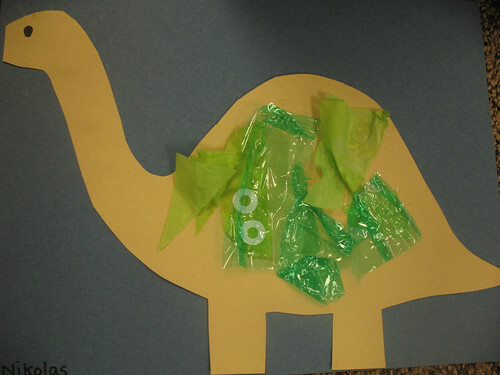 we had a wonderful unit on dinosaurs in honor of d week. 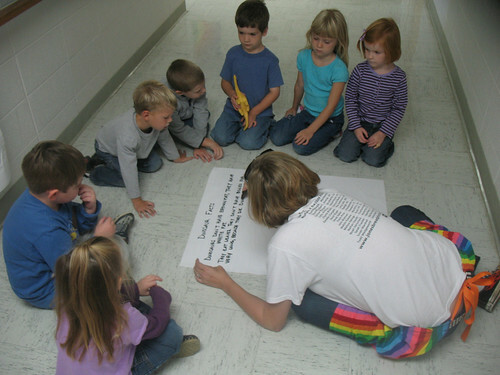 thanks to a couple of students, i learned more facts than i came in with. 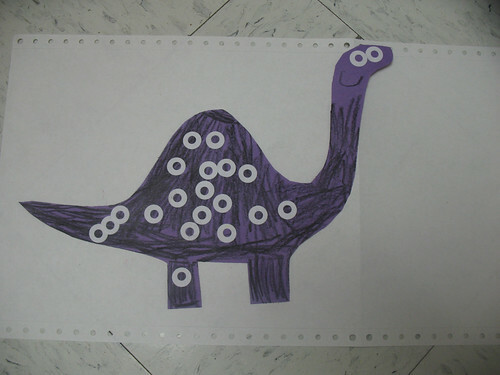 we focused on the d sound by adding dots to precut dinosaur shapes. 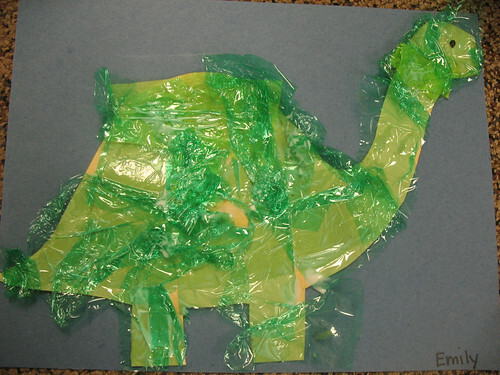 we learned about a dinosaur having scales and used tissue paper and green saran wrap as scales…some had a lot of scales, some had a few. 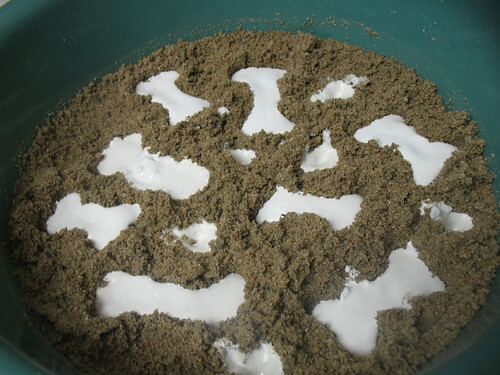 we made plaster of paris bones to excavate on the playground (and in one class i waited too long and the plaster hardened before we could! 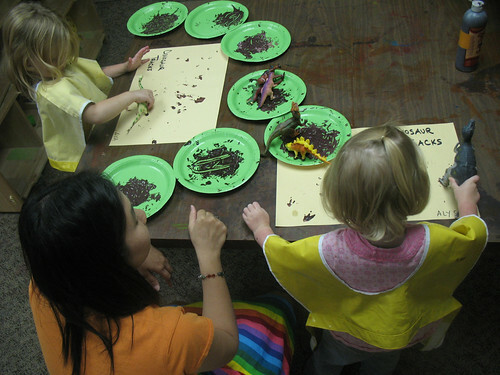 the preschoolers had a chance to see an adult mess up and have to start over!). 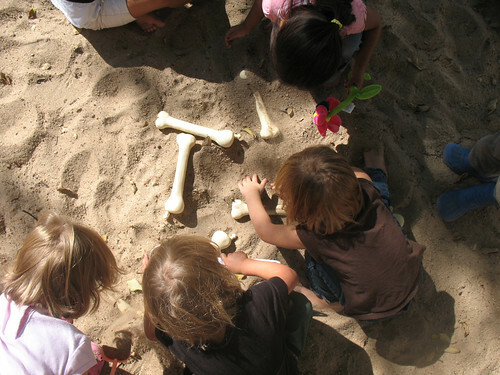 i also had 15 plastic bones (found in a store intended for a human skeleton for halloween, i think) we hid and dug over and over. 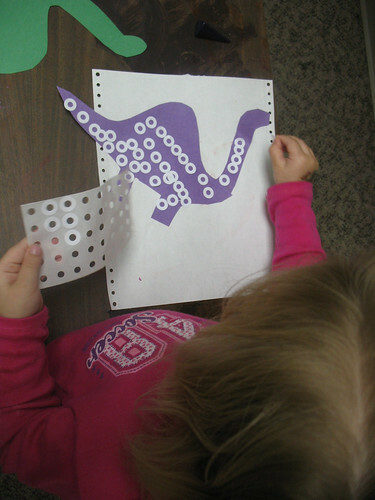 they hooked together so there was lots of counting and subtracting as we hooked and unhooked them. 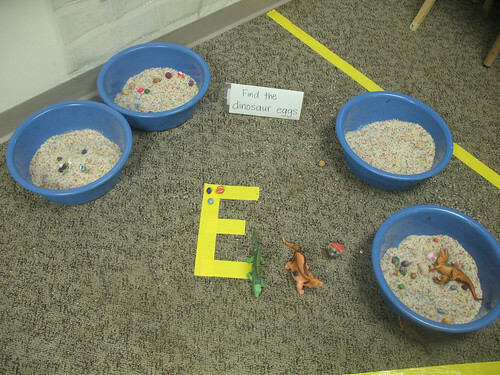 we snuck the letter E in at the end of the unit to discuss dinosaurs coming from eggs. 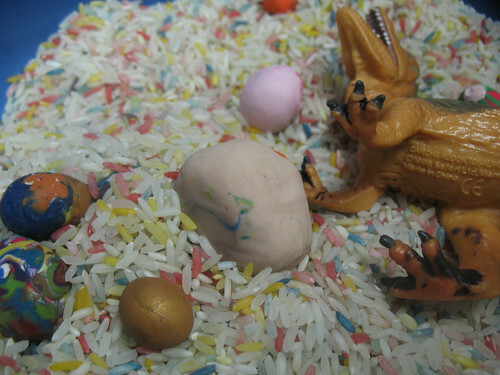 there were various sized clay eggs to hid and dig from tubs of play rice. 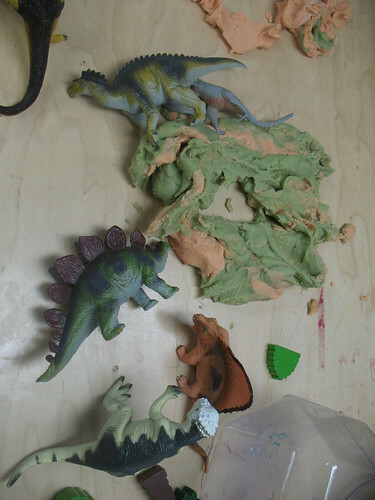 lining them up on a E made of tape helped reinforce the formation of capital E.
later that day we stuffed poster-board sized paper with more paper to make big dinosaur eggs…photos to come. it was so fun to see 13 kids with huge eggs walking down the sidewalk! 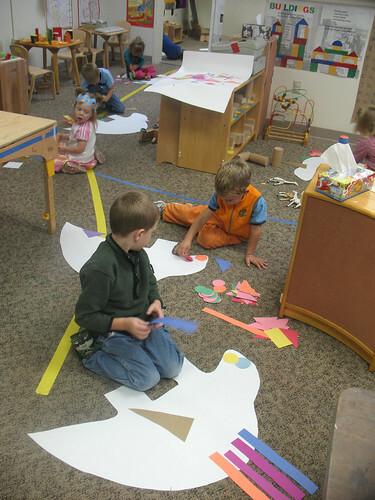 after discussions of shape and color recognition, we offered preschoolers oodles of paper shapes to glue on a big dinosaur paper. 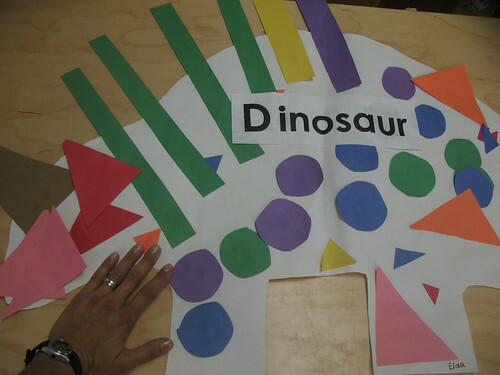 there were spikes and stripes, dots and scales. 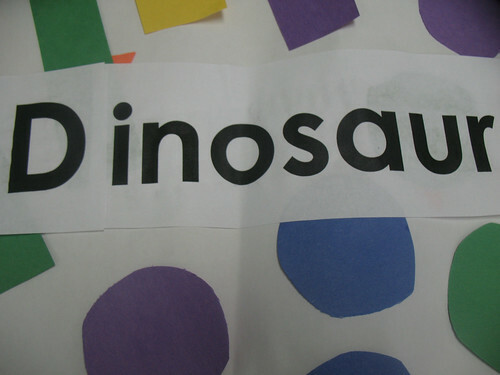 then the trick was to put the letter D in front of the rest of the word “inosaur” so that it would say “Dinsoaur!” Oh, we giggled everytime we looked at the word “inosaur” without the “D.” preschool humor at its best. 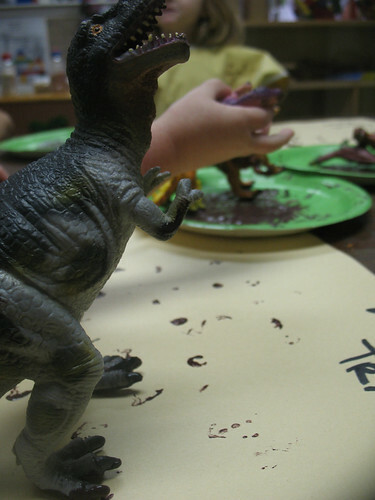 dinosaur week always brings a level of roaring and aggression that i don’t mind waiting to see until D week the next year. 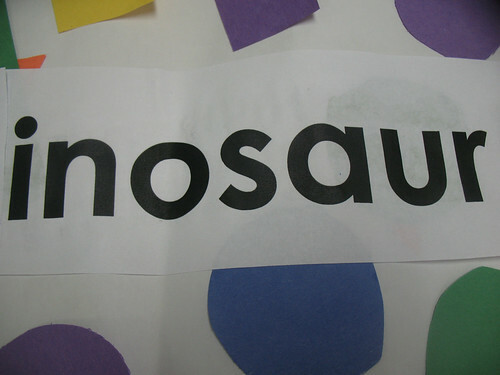 it also brings out passion and detailed information from little ones that i appreciate. 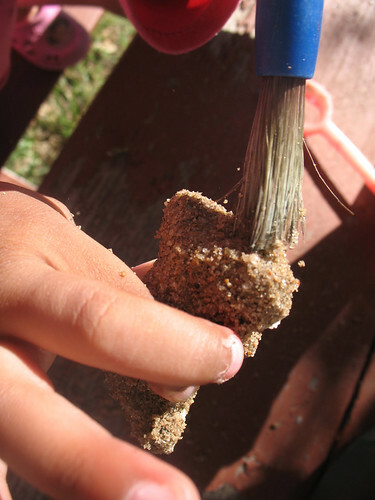 I LOVE looking at your pictures. Do your teachers always wear the rainbow skirt?